Saguaro Lake, the most easily accessible of four reservoirs on the Salt River, is a sight for eyes parched by the urban desert landscape. 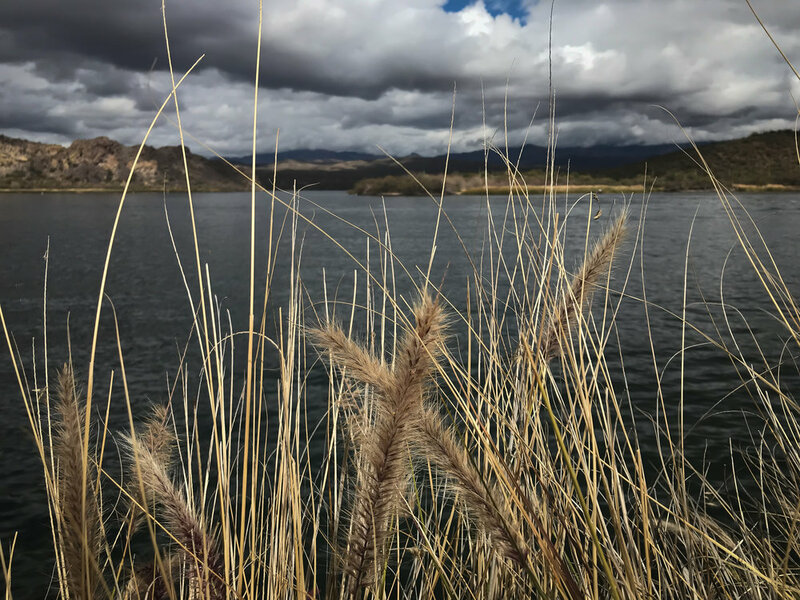 Just about an hour away from Phoenix, Butcher Jones Trail offers majestic views of this lake, its canyon walls, and the wildlife that surrounds it. What is so exceptional about Butcher Jones Trail is the view as it winds along the eastern shore of Saguaro Lake. The hike begins just north of the lake’s beach; the trailhead is well marked at the southeast corner of the parking lot. The first section of the trail is wooded with mesquite trees that accumulate into a thicket and offer a shaded canopy. This area is heavily trafficked as the view of the lake’s beach, with its marsh and striated cliff, come into view on the right-hand side. Once you reach Peregrine Point, where you see the lake’s expanse with the marina in the far right and the high canyon walls on the other side, the crowd of hikers thins. You’ll begin a slight decent toward your left as you walk along the edge of one of the lake’s fingers. The landscape is dotted with towering saguaros, cholla, jojoba, and prickly pear, just to name a few of the plants. Closer to the water, you’ll see high, marshy grass as well as cattails. The trail’s slight elevation changes add variety and interest along a path that is fairly well groomed. You’ll encounter just a few rocky patches where you’ll want to watch your footing. Along the shore you’ll see men and women fishing—standing in the water, floating in kayaks, riding in boats—trying their luck at trout, walleye, bass, and catfish. You may see other people stand-up-paddle boarding, camping, jet skiing, and speed boating. The Desert Belle, the lake’s two-story excursion tour boat glides back and forth. As a recreational site, the lake offers many various activities, but this is not to say that the lake is overwhelmingly congested. On a warm, winter morning, the amount of action on the water seemed hardly imposing. However, this might be different in the summer. While hiking across the peninsula toward the Salt River, you’ll encounter two separate forks before you reach the end of the trail. Camper’s Cove will split off to your right, leading to a marshy inlet. As you continue on Butcher Jones Trail, the second fork will split between Burro Cove and Shoreline Access. Both reach the end of the trail in about ¼ of a mile, and both offer stunning views of the river. With its slight elevation gain, Butcher Jones Trail is by no means a difficult hike. Its challenges are limited to three or four patches of rocky terrain but none that require scrambling or the use of one’s hands. Families and those new to hiking would appreciate the trail as well as those who need a deserved respite from the desert heat. From Phoenix, take AZ-Loop 202 East to the Beeline Highway 87 North. Pass Fort McDowell Casino on your left-hand side and continue into Tonto National Forest. Take the Bush Highway turnoff on the right (south) for approximately 2 ½ miles to Butcher Jones Beach Road (FR 166). Turn left and travel approximately 2 miles to the Butcher Jones Recreational Area. The trailhead is in the southeast corner of the parking lot. Tonto National Forest Daily Passes are not available at the recreation site. Make sure to pick one up prior to reaching the trailhead. You can obtain a pass at the Saguaro Lake Marina guard booth about a mile further down on Bush Highway. You can also find a retailer on this list or purchase a pass online at myscenicdrives. Since the trailhead is located in an approved picnic area, the America the Beautiful Annual Pass is accepted. Just leave the card on the car’s dashboard. Vault toilets are available in the parking area. Bring your camera. The views are photo worthy. No potable water is available—make sure to bring plenty of drinking water appropriate to the season and your needs. Watch out for horse droppings at the beginning of the trail. Wear shoes with good tread as there are a few spots with rocky terrain. As always, leave no trace. This blog was thoughtfully written by Jia Oak Baker. You can find her on Instagram at @violetsky29.